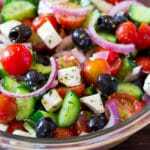 Greek Salad or Horiatiki Salad is an easy, delicious and versatile salad that is perfect with a lot of main dishes. This traditional Greek salad only takes about 10 minutes to make, and is perfect as a light lunch or paired with main dishes. Looking for more salad inspiration? Try this Honey Pineapple Rainbow Fruit Salad or Easy Creamy Summer Macaroni Salad Recipe. I make a lot of recipes ranging from different cuisines, and one of my favorite ways to eat is to pair recipes from different cuisines together. It’s like having the world on your plate, and eating dishes that belong from different countries and cultures. I love this Greek Salad, because it basically pairs perfectly with pretty much EVERYTHING I make. So that makes it a very versatile salad, right? Seriously, I make this salad almost everyday and it goes perfectly with dishes like spicy biryani, cheesy lasagne, and spinach chicken curry (yum! ), grilled chicken, and basically everything. My husband loves this salad so much that he says he just wants to eat this, instead of all the other recipes I make. 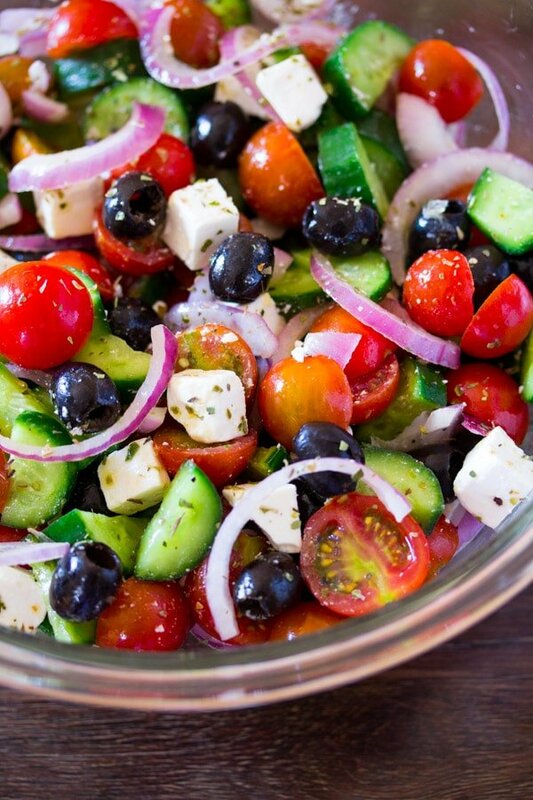 Traditional Greek Salad is made with simple, fresh ingredients. There is no lettuce in Greek Salad. It’s usually served with the tomatoes, olives, cucumber and onion on the base topped with a big hunk of feta cheese. In the pictures here, you can see that I’ve used cubed feta, but if you’re going for a completely traditional Greek Salad, then you can top it with a big piece of feta. Lucky me though, because this is the easiest salad ever. It takes only 10 minutes and as always you can adjust it according to your tastes. You only need two ingredients for the greek salad dressing: excellent quality extra virgin olive oil and dried oregano. A lot of recipes call for red wine vinegar as well, but since I didn’t have any on hand I didn’t add it to the salad. Just seven ingredients and ten minutes. That’s all you need to make this Greek Salad, which I guarantee you’ll want to eat all summer long. Just make sure to use quality, fresh ingredients since that makes a big difference in salads. 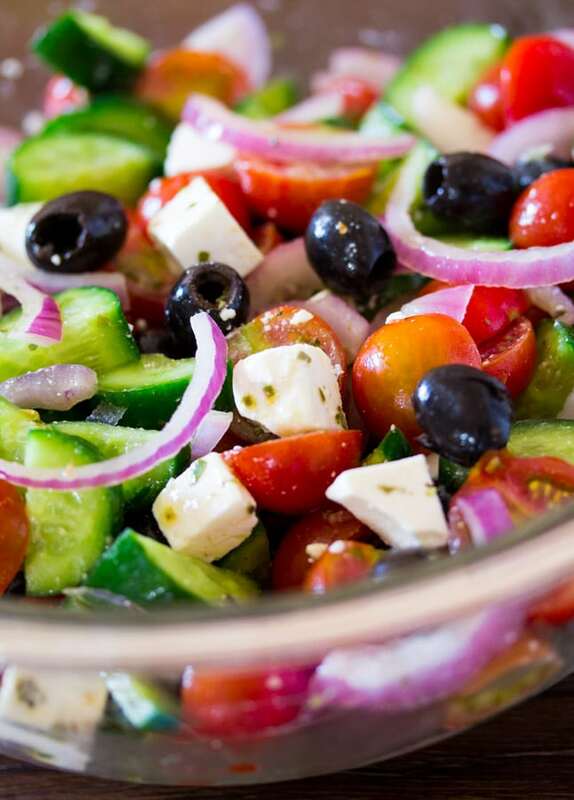 If you want to go for an authentic greek salad, then I would suggest using kalamata olives (I couldn’t find them here – so I went with black olives) and green bell pepper. I had actually planned to add green bell pepper to the salad, but I totally forgot. So if you’re wanting to make a super authentic greek salad, then I would highly suggest adding kalamata olives and sliced green bell pepper. 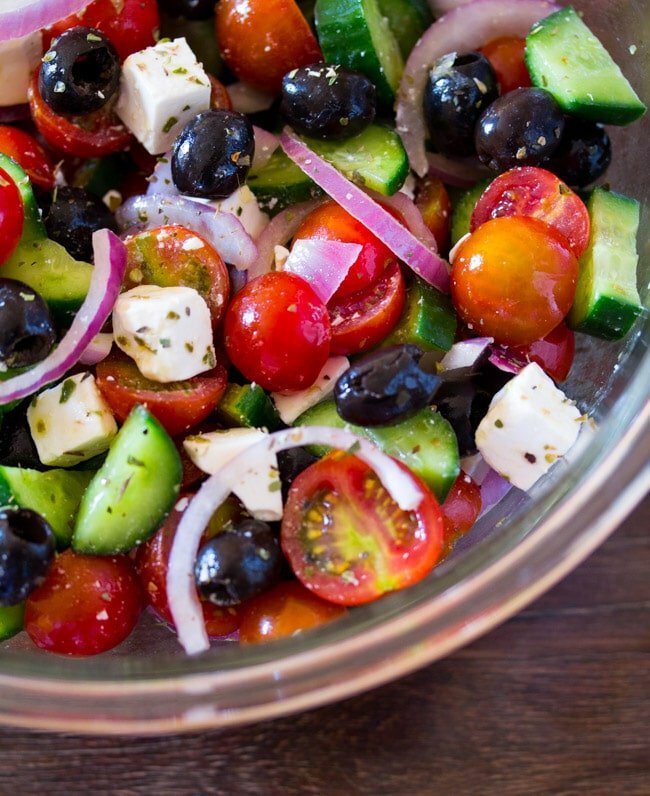 This Greek Salad is packed with fresh flavors and is ready in just 10 minutes! A few simple ingredients combined together to make a salad perfect for summer. In a mixing bowl whisk together the olive oil and oregano. Add the cherry tomatoes, cucumbers, red onion and olives and toss so that the dressing coats the salad evenly. Top with chunks of feta cheese and sprinkle with more oregano if desired. I love greek flavors and I love how easy this salad is! Love the fresh ingredients! So bright, colorful, and healthy! This was delicious! I added Chicken & lettuce to make it a main dish,main dish, used Kalamata olives & added red wine vinegar. So wonderful for Keto dinner – thank you!